If you’re tired of looking at the generic blue Mac folders, there are many ways to spruce them up. One simple and fun way is to use Folder Factory 1.8 (Mac App Store link) to customize your folder icons with color, photos and text. Launch Folder Factory and you’re presented with an attractive application window divided into four sections: the Folder section, the Picture section, the Text section, and a large Preview window. The first step to fancifying your icons is to drag and drop the folder icon you’d like to customize into the Folder section of the app window. Once added, the standard blue tabbed finder folder appears in the Preview window. 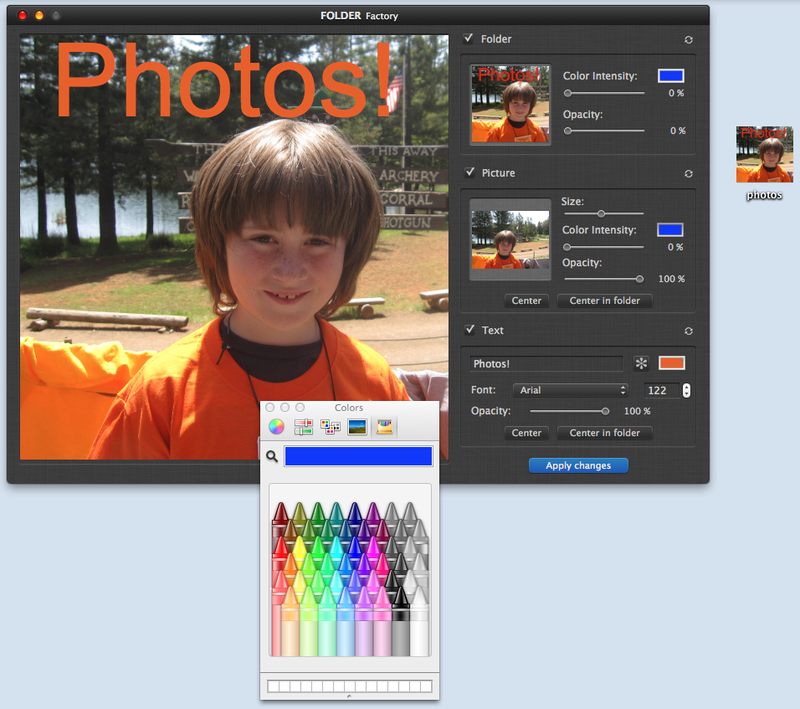 Using the intuitive tools, you can now change the color, the color intensity and the opacity of the folder. All of your changes show automatically in the Preview window. 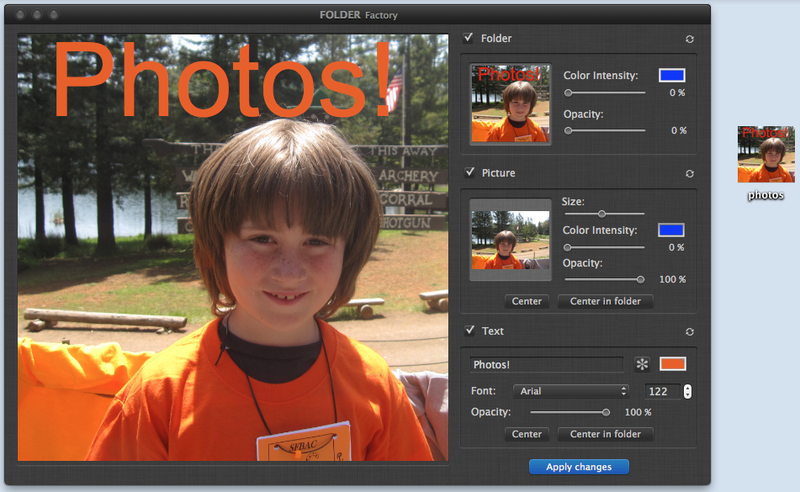 Once you’re satisfied with the folder settings, you can choose to drag a photo onto the Picture area of the workspace. The photo appears in Preview window and now you can change the size of the photo, the intensity, and the opacity of the image. You can use your mouse to position the picture, or click the Center button to put the picture in the middle of the preview window or center it within the folder image. When you’re happy with your photo, you can choose to add text. Pick the font from a drop-down menu and set the size, color, and opacity of the text using the provided tools. You can center the text or just drag it around with your cursor, which is nice. When you’re done tinkering with your folder design, hit the Apply Changes button and your new folder appears in the finder. Look closely at your new folder in the Finder before closing the app because once you exit Folder Factory the elements are merged into one image and you can’t reopen the folder to make small adjustments. If you drag a previously created folder to the Folder Factory application, it shows the custom artwork in the Folder section, but the Preview section shows the generic folder, and the text and photo sections of the application window are blank. If you click on the Apply Changes button now, the folder image in Finder will become the generic blue folder. If you want to make changes to a saved custom folder, you”ll need to start from scratch. Folder Factory is a fun and easy way to brighten up and customize your desktop. It can help to make your folders more recognizable by using photos or text that is more relevant to the contents of the folder than the standard generic blue tabbed folder. I wish editing the customized photo artwork was easier, but luckily, building them isn’t too difficult. Give your OS X's folders a new look with Folder Factory.